Beautiful modern furniture and detailed wallpaper set the Petit Flaneur Dollhouse apart from your everyday doll dwelling. Petit Flaneur designed their dollhouse with a fresh, bold exterior and a uniquely designed interior which includes a living room, dining room, bedroom, and a sweet nursery — just enough space for a small eco-friendly doll family. The Petit Flaneur Dollhouse is hand-printed and hand assembled with hardboard and water-based, non-toxic inks. All of the assembled furniture is made of birch micro-plywood and the same child safe inks. The lovely Petit Flaneur Dollhouse is available in three delectable colors: cotton candy, creme de menthe, and pigeon blue. Truly a home sweet home. Beautiful modern furniture and detailed wallpaper set the Petit Flaneur Dollhouse apart from your everyday doll dwelling. Petit Flaneur designed their dollhouse with a fresh, bold exterior and a uniquely designed interior which includes a living room, dining room, bedroom, and a sweet nursery -- just enough space for a small eco-friendly doll family. 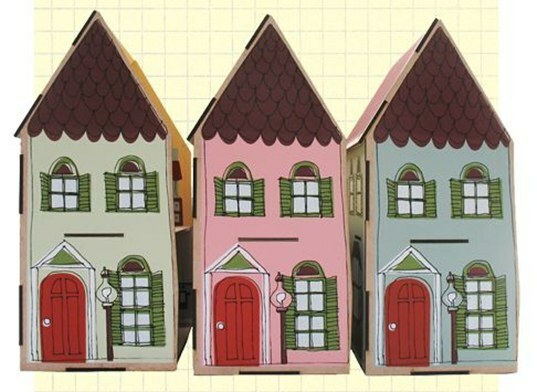 The Petit Flaneur Dollhouse is hand-printed and hand assembled with hardboard and water-based, non-toxic inks. All of the assembled furniture is made of birch micro-plywood and the same child safe inks. The lovely Petit Flaneur Dollhouse is available in three delectable colors: cotton candy, creme de menthe, and pigeon blue. Truly a home sweet home.